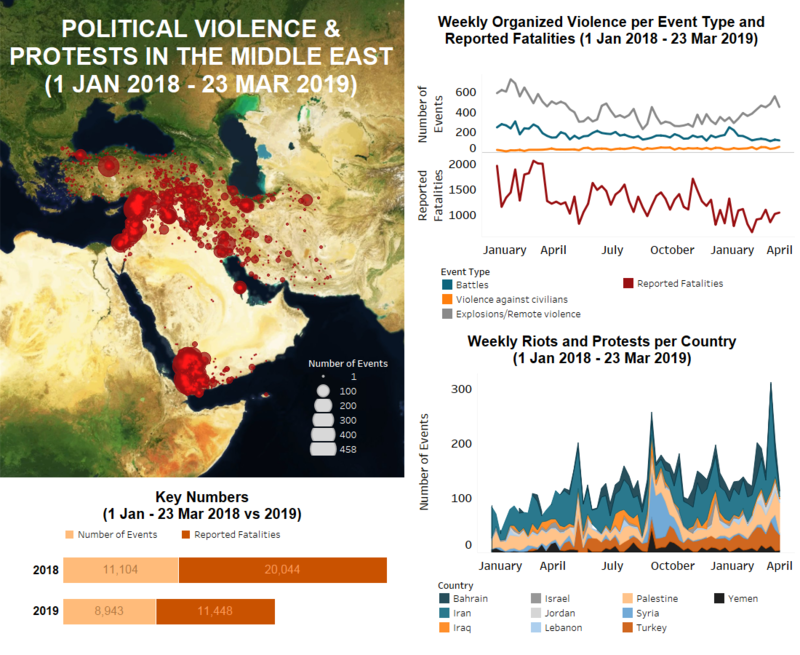 Throughout the Middle East region last week, overall instances of battles remained about the same as the week prior, while events involving only explosions/remote violence decreased following an upward trend since the beginning of 2019. Reported fatalities rose only slightly compared to the previous week. The number of demonstration events, meanwhile, decreased further throughout the region, seemingly as a result of Nowruz celebrations in several countries, particularly Iran. In Israel last week, there was a marked increase in reports of incendiary balloons being launched from Gaza. The makeshift devices were primarily reported in Eshkol Regional Council, but they were also seen in Shaar HaNegev Regional Council and the northern Negev desert. No injuries or damage were reported as a result (for more on incendiary kites and balloons, see this ACLED analysis). On Monday, meanwhile, Hamas-affiliated prisoners in the Ramon Prison set fire to mattresses in fourteen cells after Israeli prison guards tried to force the inmates into a section covered with jamming devices, which disable cellular signals. With the 9 April Israeli election around the corner, conflict activity throughout the country is expected to increase over the next two weeks as political parties vie for re-election (Israel Today, 25 March 2019). Meanwhile, in Palestine’s Gaza Strip, Hamas security continued to crackdown on demonstrators in the region from the beginning of the week, leading to several clashes. As is typical, the vast majority of demonstrations occurred along the border with Israel. On Friday, the Great March of Return resumed for its 51st week with approximately 9,500 Palestinians attending. Israeli forces responded with force, reportedly killing two demonstrators and injuring 189 – 100 of whom were injured by live fire. 51 youths, 4 journalists, and a paramedic were reported to be among the injured (Al Mezan, 22 March 2019). Additionally, there were a number of airstrikes conducted by Israeli forces on Gaza throughout the week that injured 10 Palestinians according to reports. Two more incidents were reported of Israeli forces opening fire on Palestinian farmers and fishermen, resulting in minor injuries. In the West Bank, there was a significant increase in conflict events compared to previous weeks. Two Israelis were reportedly killed on Sunday by a Palestinian near Ariel settlement when the attacker stabbed a solider and stole his gun, which he then used to open fire at a bus stop and at a second nearby location. This event caused security raids in the Salfit area as Israeli forces searched for the attacker. The man was allegedly found and killed on Tuesday during a shoot-out that injured numerous other Palestinians in Ibwain village. On the same day, two Palestinians were reportedly killed by Israeli forces after throwing crude explosives near Joseph’s tomb in Nablus. Security forces were also alleged to have opened fire on a Red Crescent ambulance when it attempted to approach the scene (Palestine News Network, 20 March 2019). Similar incidents, including a car ramming of Israeli police and Molotov attacks on Israeli civilians, were reported elsewhere in the region. In Lebanon, there were a number of demonstrations throughout the week. Among these was a thousands-strong march by mothers and children in Beirut to demand that Lebanese women be granted the right to pass on citizenship to their children. Another demonstration was held by potato farmers in Akkar against the entry of Egyptian potatoes to the local markets. Similarly, Lebanese business owners also blocked a road between Beit Chama and Bidnayel in Baalbek to demonstrate against Syrian competition. Near Sidon, a clash erupted at the entrance to Mieh Mieh Refugee Camp when a Hamas member passed a Fatah checkpoint. The Hamas member was beaten, and his car was vandalized. The clash then escalated into a gunfight, but no further injuries were reported. In the east, over 300 Syrian refugees reportedly returned to Syria from Lebanon through the Yabous and Talakalakh crossings. In Jordan, over 1,300 Syrian refugees did the same through the Nasib border. Elsewhere in Jordan, hundreds of citizens staged a demonstration in downtown Amman that called for an end to the Wadi Arabia Peace Treaty: a gas deal between Jordan’s National Electric Power Company (NEPCO) and Israel. The demonstrators also demanded the closure of the Israeli embassy in Jordan. In Iran, the population celebrated Nowruz (Persian New Year) on Thursday, which led to a distinct drop in events as festivities last 13 days. Major floods throughout the north and northeast may have also contributed to this decrease in events (Tsarizm, 25 March 2019). Only about a dozen protests were reported during the week by labour groups and defrauded investors. Furthermore, clashes erupted between residents of Andimeshk and Dezful over the relocation of a sign marking the boundary between the two rival cities. This is the second time that citizens have clashed over the sign since it had collapsed in a storm 11 months ago. Several people were reportedly injured and parts of Jondishapour University were damaged (Radio Farda, 22 March 2019). It was also a relatively quiet week in Bahrain. The few protests held were mainly to demand the release of political prisoners, with a focus on Hasan Mushaima, whose arrest reached its eighth anniversary. Mushaima was a prominent opposition leader and the secretary-general of the Haq Movement; he was arrested on 17 March 2011 and was given a life sentence for attempting to overthrow the monarchy (New York Times, 22 June 2011). In Turkey, there were a number of demonstrations related to the ongoing hunger strike against the isolation of Kurdistan Workers’ Party leader Abdullah Öcalan in Imrali Island Prison. Last week, at least four inmate suicides were reported as part of the agitation (ANF News, 26 March 2019). The pro-Kurdish Peoples’ Democratic Party (HDP) has been at the forefront of the demonstrations, although several other opposition parties have also joined. Police intervened in several demonstrations led by the HDP last week, including Nowruz festivities which allegedly involved the shouting of slogans denouncing the isolation of Öcalan. As the 31 March local elections approach, the treatment of prisoners and minority groups may prove to be an important voting factor. Last week an HDP office was damaged by an unknown group in Sapanca district of Sakarya province, while members and property of the Freedom and Solidarity Party (ODP) and Felicity Party (SP) were also attacked. Similar election violence has been reported over the past few weeks. In the southeast, a number of battles and IED attacks were reported as part of the ongoing PKK insurgency. Fighting occurred mostly in the provinces of Hakkari and Sirnak, although events were also reported in Igdir, Elazig, Diyarbakir, and Mardin. Sometime around Saturday, a makeshift PKK drone loaded with explosives was intercepted and destroyed around the Kocyigit area of Derecik city. Reports of PKK drone attacks have been relatively common in recent months, although they are rarely successful. Turkish-PKK violence also extended into northern Iraq again last week. Turkish airstrikes targeted alleged PKK positions in several districts of Erbil and Dahuk governorates. On the other hand, the PKK reportedly conducted high fatality ground assaults on Turkish forces in Soran district of Erbil. Meanwhile, social unrest ignited in Mosul as a result of a ferry sinking in the Tigris River and reportedly killing at least 97 people. Demonstrations occurred within the city, and both the provincial governor and Iraqi president were besieged by angry mobs when they attempted to visit. Ongoing grievances of state corruption and neglect were intensified by the event, culminating in the removal of Ninewa’s governor by the Iraqi Parliament on 24 March (New York Times, 24 March 2019). Elsewhere in the country, fighting continued between multiple armed groups – mostly Islamic State (IS) – and Iraqi state forces in a number of governorates. Of note were several engagements between Iraqi soldiers and Sinjar Resistance Units (YBS) fighters in Sinjar district of Ninewa over three days. YBS are a Yazidi militia formed in 2007 as a result of insurgent attacks on their communities, and have mostly been involved in fighting IS. While the exact cause of last week’s violence is not fully understood, there is an alleged dispute over the administration of the district’s Syrian border crossing (Kurdistan 24, 21 March 2019). In Yemen, fighting increased last week as a result of recent flare ups in the cities of Taizz and Aden, in addition to the long-established battlefronts between Houthi and anti-Houthi forces. Clashes erupted early in the week between the 22nd “Mika” Brigade – which allies itself with the Islah party and leaders in the political General People’s Congress (GPC) – and the 35th Armored Brigade, which contains elements of a Salafi group called Abu al Abbas. Although both parties are technically allies in supporting the internationally-recognized government against Houthi forces in Taizz, tensions between the groups have remained high and clashes have been fought in the city throughout the duration of their concurrent deployment in Taizz. Some of the heaviest fighting to date between the two groups occurred last week, with buildings, mosques, and civil infrastructure being destroyed. The current disputes began after Islah fighters tried to disarm Abu al Abbas fighters following ambivalent instructions from the Taizz governor (Twitter, 23 March 2019). Meanwhile, anti-Houthi troops continued to battle Houthi forces throughout the country, with intense clashes taking place in Damt district of Ad Dali governorate, as well as in the northern border areas and the battlefronts of Al-Baydha. While a few small villages were taken from Houthi control in Baqim district, Sadah governorate, the frontlines remained essentially unchanged throughout the week. Lastly, in the temporary capital of Aden, security forces clashed with demonstrators following the arrest of a man in Burayqah. At least three people were reported to have been killed during the ensuing violence. Arbitrary detainment and “secret prisons” – which are administered by UAE-backed forces in the city – have been a major grievance to locals in the southern parts of the country (Amnesty International, 12 July 2018). In Syria meanwhile, regime shelling of the DMZ in Idleb, Hama, and Aleppo governorates continued, albeit with somewhat reduced intensity. At the same time, Russian warplanes ramped up their activity in the area, reportedly resulting in several deadly attacks across Idleb. Rebel and Islamist groups such as Hayat Tahrir al Sham (HTS) responded by increasing shelling of regime positions in northwest Hama. In the east, Syrian Democratic Forces (QSD), backed by Global Coalition airstrikes, achieved a decisive victory against IS in the Hajin enclave as they took control of the last-remaining IS pocket west of the Euphrates River at Baghuz farms. During the effort to retake the area, it was reported that, in a single day, Coalition airstrikes on the IS encampment killed around 230 IS fighters and family members. While the larger battle to eliminate IS’ territorial control was won, sporadic clashes took place in the mountains north of Baghuz as a number of IS fighters managed to re-infiltrate the area. In coming weeks, these clashes are likely to continue as QSD and its Coalition allies attempt to clear the remaining fighters from an area well-suited for them to take cover in. In southern Syria, following the reignition of anti-regime protests in several areas of Dar’a in recent weeks, Dar’a Popular Resistance fighters carried out two attacks against the regime’s Air Force Intelligence Directorate detachment in the strategic town of Da’el. An increase in both protest and armed anti-regime activity in the south – which was fully reclaimed by the regime less than a year ago – is likely to prompt an intensified crackdown by the regime in the form of increased arrests and raids.